Selling is hard, especially in today’s world. While all aspects of selling are hard, getting the sale started is probably the most challenging aspect of the process. Prospects are inundated with more commercial messages and inquiries than ever before. On top of that, prospects have more tools than ever before to keep salespeople away. It’s no wonder that it takes more effort than ever before to make that initial contact. Making the stakes even higher is the importance of the impression and positioning that the first contact creates. A strong start makes every aspect of the process that follows much easier, while a poor start makes everything far, far more challenging. This is a major reason why marketing and sales must work together to create the environment that allows more initial sales conversations to occur. When they do occur, sales reps - whether they are sales development reps, account executives or senior business execs - must be prepared to make it an impactful, resonating conversation that builds a strong foundation for a successful sales process. And that’s why it’s so depressing when I hear some of the stupid things people in a selling position say when beginning conversations with prospects. I hate to be so negative, but I know what it costs (and what companies should be investing) to create qualified leads (if you don’t know what you should be investing and would like to, you can download our target sales cost calculator). When salespeople use trite terms or begin a conversation unprepared, it destroys all of the hard work that the entire demand generation team invested into creating the opportunity. I often read blog posts that exclaim that outbound marketing is dead, and while they lack the data to support such a claim, they’ve got plenty of stories about poor outreach to support what they're saying. 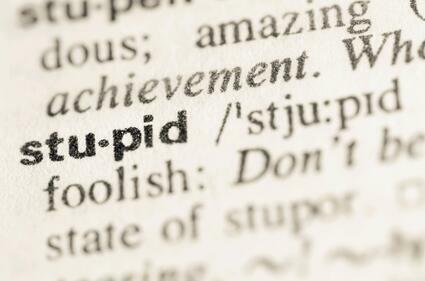 Over the years I’ve heard salespeople say a lot of stupid things early in a sales conversation. Here are the top six. Avoid them and watch your sales grow. One thing that makes this statement/question so damaging is that 10-15 years ago it was a great sales conversation starter. Today, if you’re reaching out to me, you had better know something about my company, what’s happening in my industry and what my challenges are. How can you possibly know this simply because someone downloaded something, or a prospect was on a list you are pursuing? The answer is quite simple. From the buyer personas you’ve created, by visiting my website and completing some simple research. In today’s selling world, you must earn your prospect’s attention, and the first way you do that is by knowing who they are before you connect with them. 5. What do you need/Where does it hurt/What keeps you up at night? This is a close cousin to the previous statement. If you have to ask me what my problems are, you are a peddler and you are creating no value. If you’re talking to any prospect who has any power to guide a purchasing decision you are expected to know their problems without having to ask them. Frankly, that’s the primary reason that the prospect is giving you time on their calendar in the first place. They expect that they’re going to be able to learn something of importance from their time talking to you. If they don’t feel like they’re learning within the first couple minutes of talking with you, they’ve most likely ended the meeting/call...even if you’re still talking. 4. Who is the decision maker? This has always been one of my favorite stupid questions that salespeople ask. Have you ever been to a networking event or party where you’re talking to someone and they keep looking over your shoulder to see if someone more interesting or more important has showed up? Wait...this only happens to me? Of course not. How does that make you feel? Now imagine the person constantly looking over your shoulder wants something from you. What’s the likelihood you’re going to do anything for them? Well that’s what happens when you ask that question. What’s the fix? First you should have a fairly good idea about the level of the person you need to make such a decision, so you shouldn’t have to ask the question to begin with. The nature of the questions you ask and the message you deliver should naturally lead you to connect to the right level within your prospect. On a side note, if you’re ever stuck at a level below where you want to be and you want to move up the prospect’s organization, ask a question that only that person could legitimately answer. Finally, if you want to narrow down the process and confirm your assumptions, asking a question like “So how does ABC Co. typically go about assessing and implementing a program/product/solution like this?” You’ll find you get much more valuable insights. Oh yeah, one other thing, that’s a question to ask after you’ve created some value not before. This statement (or ones similar) is my absolute favorite stupid thing that salespeople say. It’s the single fastest way to identify a poseur and know that I should run away. My favorite variation of this is a really hot term for technology companies. When some sales rep starts telling me about their “proprietary,variable algorithm” that’s a “game changer” I know to grab my pockets, turn around and run. It’s funny, but the people who have the best products/services are the ones that don’t work so hard to prove it. They know their job is to enable their prospect to discover their strength...no convincing necessary. I learned about this one early in my sales career, as I was guilty of using it. Luckily I had a manager who was willing to absolutely annoy the bejeebers out of me. Every time I would use the term, she would interrupt me and say, “Wait Doug, were you lying to me before?” That’s precisely the feeling you give when you use this term (or ones like it). Here’s the bottom line and the message of this post. Selling is in fact hard, but stop trying so damn hard to sound important. Be yourself. Talk to your prospects just like you would if they were great friends. Drop the bravado, ditch the jargon and just have genuine conversations focused on helping them solve important problems.